Produce crisp lines and detailed drawings, using Original HP inks and printhead technology. 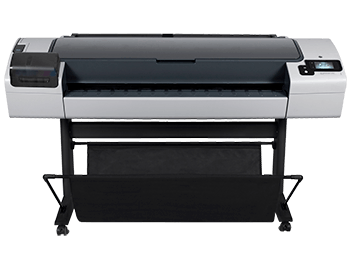 Print up to A0/E without sacrificing quality. Create an A1/D-size print in 28 seconds with Economode. Process complex files fast with 16 GB memory, HP-GL/2, and PDF support for most operating systems and CAD software. Invest in the future-software updates occur automatically, keeping your printer as current as your business. Benefit from unattended printing with 300-ml Matte Black Original HP ink cartridges. Print TIFF, JPEG, and PDF files from your printer's touchscreen or a USB thumb drive-no computer required.